THE tight labour market has helped drive up wages and employment for locals while foreign employment growth fell to its weakest level since late 2009. Latest data from the Ministry of Manpower (MOM) released yesterday also showed that retrenchments fell while job vacancies hit a record high. But while the numbers are glowing, the ministry warned of further company closures as the economy continues to restructure. Employment grew by 27,700 in the three months to June, down from the 33,700 jobs created in the same period last year. Of the jobs created in the second quarter, just 3,800 jobs went to foreigners, the slowest pace of foreign employment growth since the third quarter of 2009. The bulk of the jobs created went to locals, supported by a "confluence of foreign workforce constraints, higher wages and employers' adoption of flexible work arrangements to attract more women and older workers", said MOM. The citizen unemployment rate fell to 2.9 per cent in the second quarter from 3 per cent in the first three months of the year. The real median gross monthly income of fully employed citizens increased by 4.6 per cent last year, said the ministry. Economists said that the strong wage and employment growth for locals will continue to hold, with firms looking to expand in the region. But companies with expansion plans may face difficulty in recruiting as there is already a record 63,900 job vacancies as of June. OCBC economist Selena Ling said the pick-up in wages should continue to help low-wage workers. "If the wage increase is passed on by businesses to consumers, then the real income growth will be muted," she said. For higher wages to be sustained over the long term, MOM said that productivity must improve further. "More needs to be done to raise productivity, most critically in the construction sector, as well as the more manpower-intensive industries within the services sector," it said. MOM noted that productivity of the construction industry was negative in the first half of the year. As a result, overall labour productivity in the second quarter was dragged down and fell by 1.3 per cent. The ministry added that the firms in the service sector, such as restaurants, retail shops and hotels, will feel the pressure to raise wages as many are expanding and need more staff. 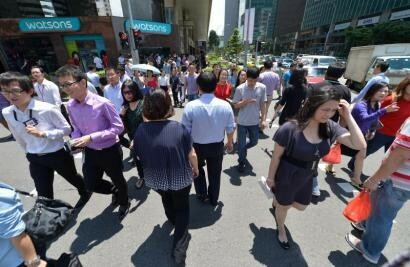 "The manpower-lean environment will continue to be a feature of the Singapore economy," said MOM. "As the economy restructures, some consolidation and exit of less productive businesses is expected." Bank of America Merrill Lynch economist Chua Hak Bin agreed. "We have not seen the full brunt of the foreign manpower curbs yet. There will be further tightening, so firms can expect the pain to continue," he said. The report also said that 2,410 workers were laid off in the second quarter of this year, lower than the 3,110 workers who were retrenched in the previous quarter.